This issue of Otolaryngologic Clinics, Guest Edited by Drs. 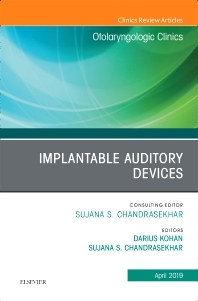 Darius Kohan and Sujana S. Chandrasekhar, is devoted to Implantable Auditory Devices. Articles in this outstanding issue include: Medical and Audiological Indications for Implantable Auditory Devices; Limitations of Conventional Hearing Aids; Non-implantables: Deep Canal Hearing Aids; Physiology of Osseointegration; Osseointegrated Auditory Devices: Baha and Ponto; Osseointegrated Auditory Devices: Sophono; Osseointegrated Auditory Devices: Bonebridge; Ossicle Coupling Active Implantable Auditory Devices: Magnetic Driven System; Ossicle Coupling Active IAD: Vibrant Soundbridge; Totally Implantable Auditory Devices; Electro-acoustic Stimulation; Special Populations in IADs: Pediatric; Special Populations in IADs: Geriatric; Special Populations in IADs: Developmentally Challenged; Special Populations in IADs: Musicians; Implantable Auditory Devices: Financial Considerations and Office-Based Implantation; and Future of Implantable Auditory Devices.